With maximum space for the user, the Birdie offers a truly comfortable transfer to or from beds, chairs or even the floor. The Birdie maximises space for the user even when the lifter is in the highest position. 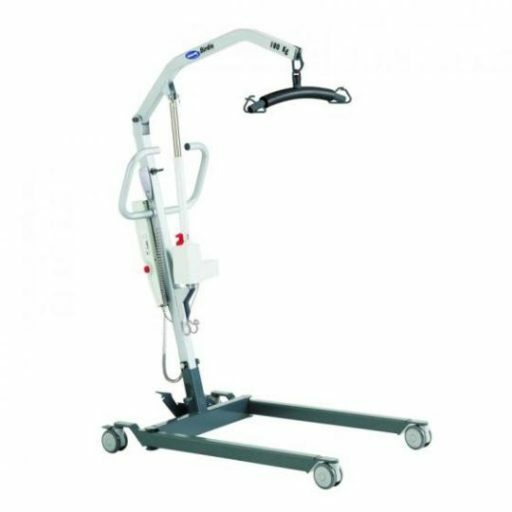 The Birdie is available with manual or electric leg adjustment and has a 180kg weight limit, making it ideal for in the nursing or care home environments. Compact without compromising on comfort. TOTAL USER COMFORT The Birdie maximises space for the user, even when the lifter is in the highest position, providing a very comfortable lift and transfer since the user can easily be rotated in the lifter. Consequently, it makes the placing of the user into the bed/wheelchair much easier for the carer. The Birdie is capable of lifting a patient from the floor. SIMPLE TO FOLD AND UNFOLD WITHOUT TOOLS Transporting and storing the lifter has been made as easy as possible as the Birdie can be folded and unfolded without the need for tools or special skills required. You can even store the Birdie upright to take up even less space. NEW INTELLIGENT SERVICE & MONITORING SYSTEM The Birdie Compact answers the patient and organisation’s need for a safe and comfortable lift with an intelligent service monitoring system built into the control box. This intelligent monitoring system includes a service reminder, emergency operation, audio battery alarm, and battery indicator. The control box also provides a safe and comfortable lift for the client via ‘soft start’ and ‘soft stop’ button mechanisms. CONFIGURED TO USER NEEDS Users can enjoy maximum flexibility with a range of spreader bars and a very comfortable sling range, which allows for individual adjustment of the transfer. The new quick release attachment system makes configuration even easier.